I recently got married and for our Honeymoon we went on a cruise to Alaska. After some research I found a great ship for us to board - the Celebrity Solstice is a culinary flagship for the Celebrity Cruise fleet and had many delicious adventures on board. Put asside your ideas of cruises as endless cheap buffets and check out some of the wonderful food we had on board. On arrival we were presented with hors d'ouvres and sparkling wine to enjoy on our balcony while we embarked. Every day we had the option of additional canapes served in our room - great for those relaxing days at sea with no day trips. A decent room service was also available 24 hours with standard offerings included in our ticket price or more upscale affairs for an additional cost. 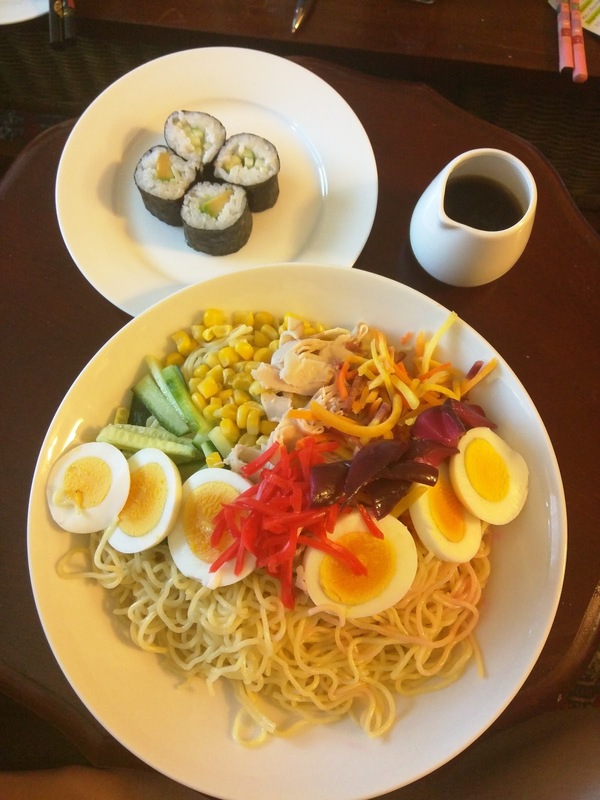 Not a bad option for late night snacking after checking out the ship's many bars! Being our Honeymoon we wanted to celebrate and not worry about the bill so I opted for a premium alcohol add on to our package. This meant endless arrays of cocktails, spirits, beers and wine at the bars. The Premium option included mixology madness like this ice bar. Of course it wouldn't be a vacation without the occasional tropical cocktail - this is their version of my favourite the Pina Colada. A reasonable array of wines was available at all the restaurants - limited options for by the glass but an extensive cellar by the bottle. For those wishing to have high end vintage wine there were many options to buy bottles as an add on or even add a dozen bottles of wine to your state room. The spirits on the premium package surprised me with multiple options for single malt Scotch, sparkling wines, Cognac and high end options for liqueurs, vodkas and gins. Being our Honeymoon I'd opted for the "Aqua Class" suite which included access to our own restaurant. Cheaper classes of ticket had set dining times in a dining hall built for 1000 or so seats at shared tables. Hardly the romantic Honeymoon experience I was after! The Blu Restaurant however had free seating times and offered excellent breakfast and dinner options. As well as a rotating seasonal menu they included repeated healthy and "plain" food options for the diner with specific requirements. A healthy low carb breakfast - cold meats and salad with cottage cheese, coffee and sparkling water. Two "formal nights" were included in the cruise. Everyone dressed up to the Nines and there were dance parties with live bands all over the ship. During formal nights the restaurants offered special dishes like this lobster tail. Hmm! Of course, I couldn't go on a cruise to Alaska without having a Baked Alaska. What a cute presentation. The Blu restaurant didn't offer lunch and often we were either on day trips off the boat or relaxing in the spa or heated pool area so a formal seated lunch wasn't really what we were after. Vacation is no time to think about calories so we also visited the holiday mode Pool Grill where we indulged in burgers, hot dogs and fries by the pool - complete with Australian beer! A full service buffet was on offer open all day and included healthier options like salad, quiche, sandwiches and less healthy ones like cookies, cake and fried delights. Want some privacy? There's always room service and a view over the ocean on your balcony. What really set the Celebrity line asside was the number of truly high end specialty restaurants on board. These needed to be booked for an additional cost on top of your cabin but for a special occasion like ours they really hit the right notes. The Tuscan Grille was a high end Italian steakhouse with a magnificent view out the back of the boat which made for ideal sunset relaxation. A Pan Asian restaurant had an array of Japanese, Thai, Chinese and Vietnamese dishes. While it looked lovely we started running out of meals to try the restaurants and I was only able to get a look at their dish display during their Food Fiesta. Murano was a high end Italian formal dining restaurant offering both a degustation and an a la carte option. This pork belly with heavenly crackling came in a sauce that was worth chasing around the plate to the last drop. This surprised me as being the best lobster dish I'd ever eaten. Indulgent with a butter, cognac and shallots I could have come back for this dish alone multiple. They had an amazing cheese board as well - so we just had to opt for one of everything. Triple creme, soft brie, Roquefort and Delice de Bourgignon. Enough to make the eyes water and a foodie cry into the plate. They even sent us a gorgeous little cake - sadly after 5 courses, an amuse bouche and petit fours this was really pushing what even my celebratory stomach could handle! I was so excited for this activity on board I could barely contain myself! As a culinary ship they offered a huge food program including lectures from the executive chef on prepration techniques, suppliers and recipes. Best of all though was a full tour of the Galley on the main restaurant. We got unique insight into the machinations of the kitchen including all the healthy and cleanliness processes required to keep the ship free of onboard illness. I was particularly impressed to see how they handled allergens with special parts of the kitchen reserved for customer meals noted as having allergies and separated handling of milk and meat. These buffet displays were a work of art! Mass plating Caesar Salad in preparation for a meal about to be served. Checking out the recipes - these are all approved by central corporate executive chefs and designed to control quality and portion size. I was impressed to see how the ingredients list made sure to use some ingredients earlier in the cruise and to ensure that there was plenty of crossover in ingredients across various dishes. A great way to control the food pipeline. With 3000 passengers to serve and multiple restaurants offering a variety of specialty dishes there was an impressive range of crockery and glassware. Here you can see some of my favourites like Spanish terracotta cazuelas and divetted escargot plates. It was super fun to watch a chef plate a hundred slices of Pecan Pie with a deft flick of the wrist. Where else do you get to see mass food production with such quality? After enjoying our meal at Murano so much we were delighted to discover they had a cooking class. Together with the executive chef we learnt to cook and plate our own three course meal with matched wines. They even gave us a book all about Celebrity Cruises food culture! A delightful avocado and crab choux puff with flying fish roe and smoked salmon with micro greens - made by me! This was my first cruise - but also one of the only practical ways to see Alaska. I was worried going into this trip that the food would be mediocre but boy were we surprised. Admittedly we had skipped the budget options of buffets and mass dining but the food quality was amazing for us - easily equal to eating at good restaurants in a large city. We loved all the options they had like mixology classes, wine tastings, food tours and cooking classes. The chefs were all extremely friendly and remembered us from all our dinners, questions and happy moments. I think I received more blessings on our marriage from the food staff on Celebrity Solstice than I did at the wedding itself! I cannot recommend this cruise and cruise line enough, if you're looking for a splurge or a way to see Alaska definitely consider this option. This is definitely a cheat day treat but to me a katsu sando is the best sandwich in the world. It hits all the major indulgence food groups - fried meat, fluffy bread, spicy morish sauce and rich Japanese egg mayonnaise. Tonkatsu is the Japanese version of schnitzel - breaded and fried pork or chicken cutlet. After watching one of the contestants make this favoured dish on Food Network Star recently I just had to make one! 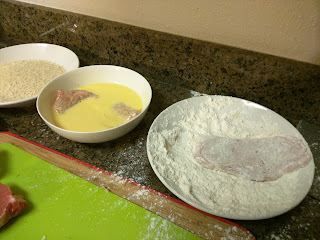 Place the cutlet in the flour and then using a fork push the flour up into the sides of the cutlet, turn over and repeat. The meat should be completely covered in the flour. 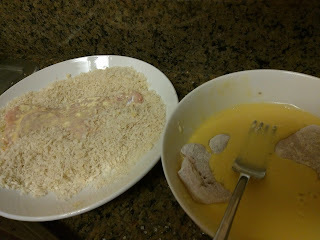 Once the cutlet is completely covered in egg mixture use the fork to lift the cutlet and drain off excess egg before placing in the breadcrumbs. 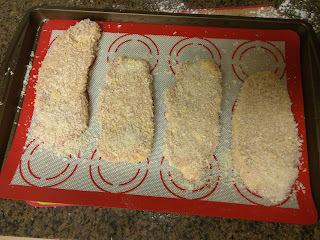 Cover the cutlet completely in bread crumbs and then turn over, ensure that all the meat and egg mixture is covered in the crumb. Your completed schnitzels should look like so. 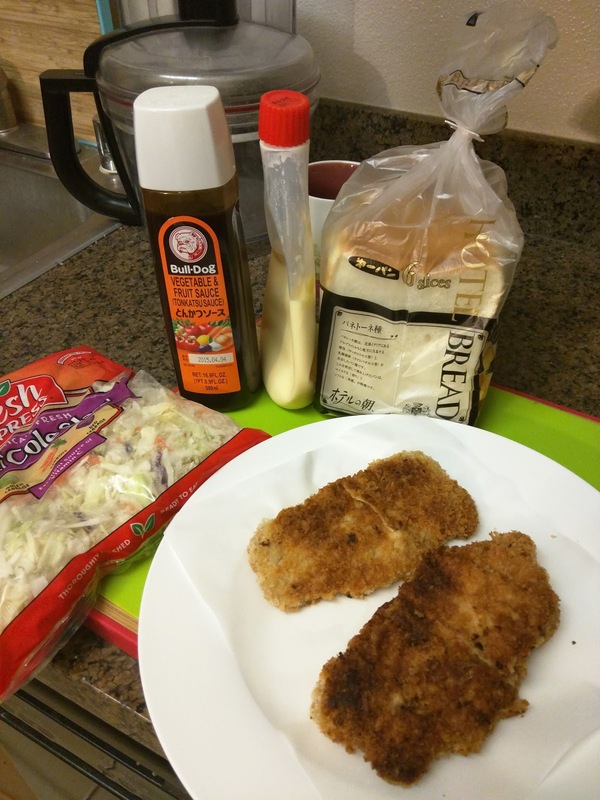 If you want to make less than 4 sandwiches move the excess fillets to the freezer and use them later - tonkatsu is great with rice, salad or vegetables! 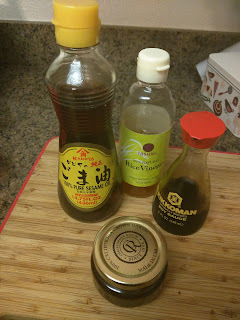 Heat a pan on medium heat and add a high temperature fry oil like grape seed oil. Use tongs to transfer the cutlets to the hot oil, the bread should sizzle when you add it to the pan. If it doesn't your oil is not hot enough and your sandwich may turn out greasy. You can deep fry the cutlet but this is not required, a pool of oil about the size of a pancake should be enough to shallow fry the cutlet. 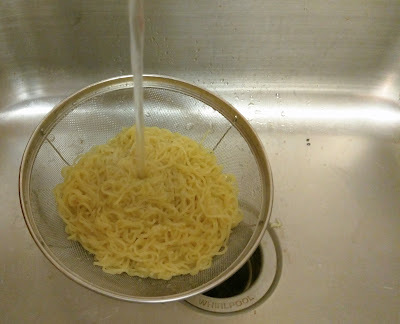 Fry until the crumb turns golden and then flip. 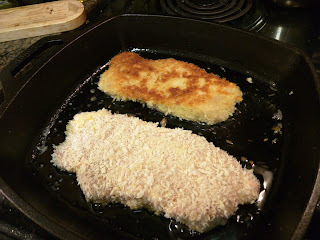 If desired you can add more oil in when you turn the cutlet to ensure that there is enough oil for even frying. 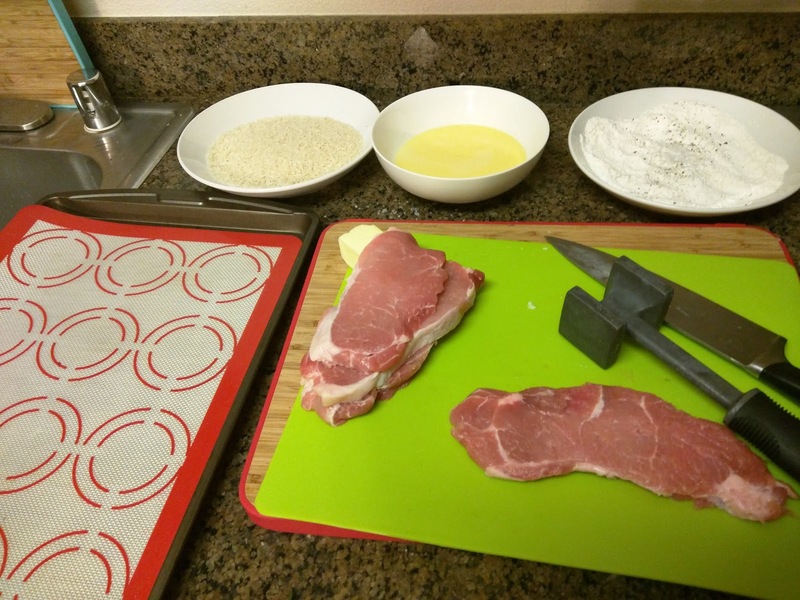 Once the crumb is golden press the center of the cutlet with your tongs - if the meat is cooked it should be firm and the tongs should not spring to the touch. Using your tongs move the cutlet to oil absorbing paper or paper towel to soak up the excess oil. Tonkatsu sauce can be bought at any Asian supermarket or on Amazon. I like this Bull Dog brand which can be bought in most good Asian stores. On the other side of the bread liberally cover with Tonkatsu sauce. If you like a lot of sauce then pour it directly onto the breadcrumb coating of the meat rather than onto the bread. 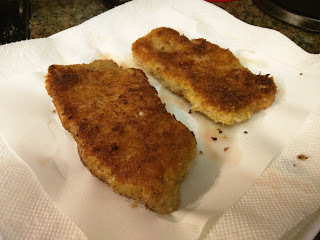 This takes some of the crispness out of the cutlet but gives you a rich oozy sandwich. 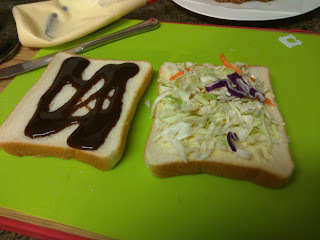 Cut the sandwich in half and serve cut side up to your diners. 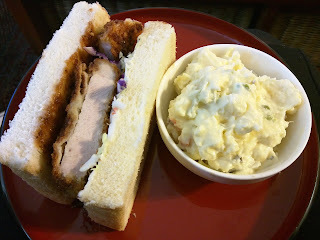 You can cut the sandwich into 3 or 4 slimmer slices if you want to fit it into a bento.